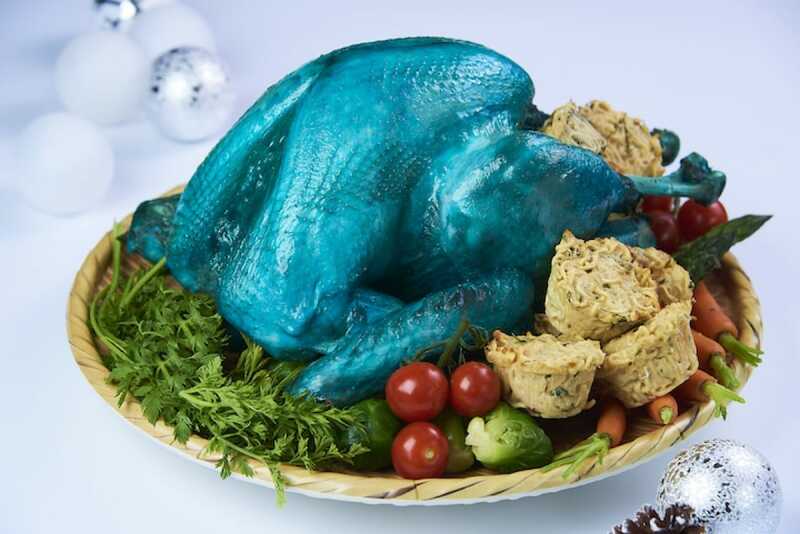 This year’s offerings for dine-in and takeaways range from birds dyed blue to Hong Kong-style soya braised turkey. For many households and restaurants, the whole roasted turkey is usually the centrepiece of any Christmas dinner. For something a little more eye-catching, check out some of this year’s more unusual offerings for dine-in and takeaways that range from birds dyed blue to Hong Kong-style soya braised turkey. 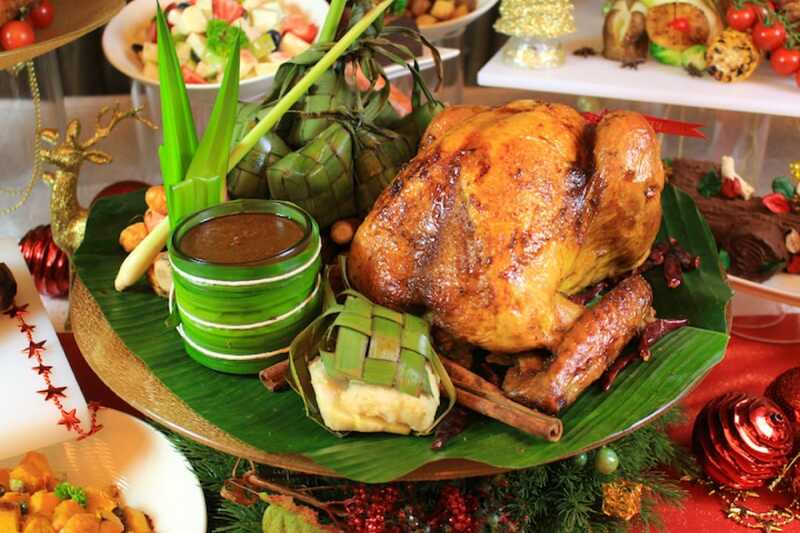 This brightly coloured fowl will surely be a conversation starter at Indonesian restaurant Rumah Rasa’s festive buffet. It is, however, not as artificial as it sounds. The tandoori turkey is braised with naturally blue butterfly pea flower till tender before being roasted in the oven. Addictive Indomie instant noodles are folded into bread, soaked in milk and tossed with herbs and spices and served alongside as turkey stuffing. 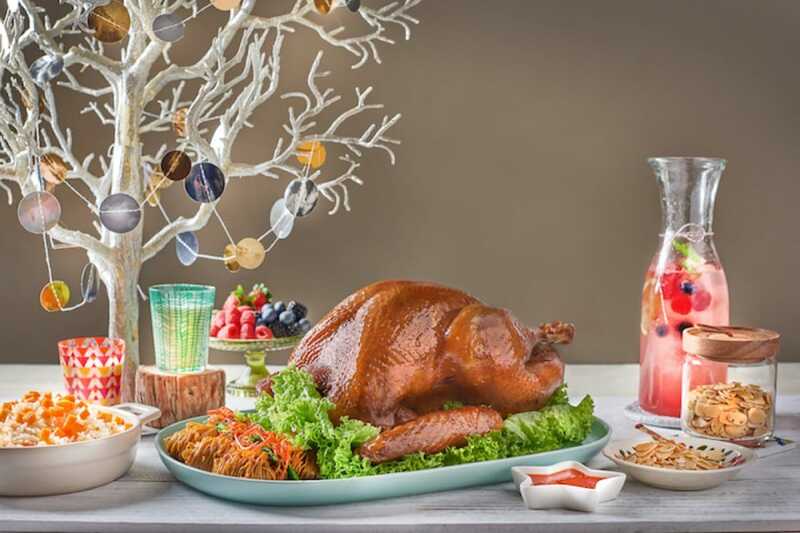 The blue bird will be the centrepiece of an Indonesian-themed festive buffet at Bay Hotel Singapore’s Rumah Rasa restaurant, priced at $48++ per adult for lunch and $68++ for dinner with a live BBQ station. Can’t get enough of tandoori chicken? Rev up your appetite for the turkey version of this beloved Indian dish by Holiday Inn Singapore Orchard City Centre. 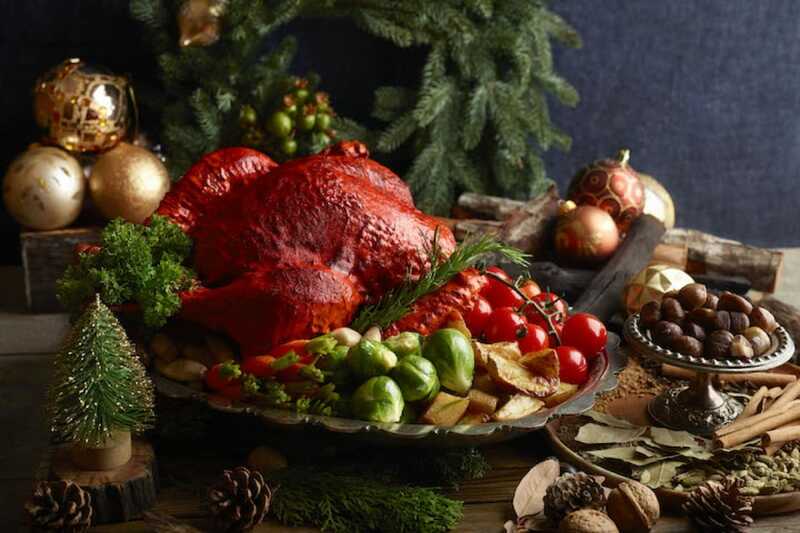 A long-time Christmas best-seller by the hotel’s Indian restaurant, Tandoor, the Tandoori Turkey ($120 for eight to 10 people) is perfumed with cloves, coriander, cumin and turmeric before it is roasted in an oven. Accompanying the bird, which weighs 4.5 to 5kg, are hot seared garlic naans to make a turkey sandwich. The popularity Hong Kong-style soya sauce chicken has surged in recent years, thanks to Liao Fan Hong Kong Soya Sauce Chicken Rice & Noodle’s one-Michelin-star rating for the past three years. Now, Goodwood Park Hotel has incorporated the slow-braised cooking method to a Soy Braised Turkey ($238 for eight to 12 people). The bird is juicy and succulent with a gleaming supple brown skin. The chefs spend about two hours slow-cooking the turkey, which involves ladling the dark and light soya sauces infused with aromatics such as cinnamon, cloves and star anise over the bird. The turkey is accompanied by a choice of pumpkin rice or egg noodles in soya sauce with blanched vegetables. Other quirky turkey treats include Mini Turkey Char Siew Po Lo Buns ($15 for 6 pieces) that are fashioned after the Cantonese-style buns which resemble pineapples and breaded fried nuggets of turkey rillettes wrapped in chee cheong fun or rice noodle roll ($20 for 12 pieces). The popular char-grilled skewered meat dish of satay is re-imagined in turkey form at Hotel Fort Canning’s new Christmas offerings this year. The Satay Turkey ($138) is marinated overnight with an aromatic blend of spices that are also used in the seasoning of satay. They include lemongrass, turmeric, galangal, cumin and coriander powder. The marinade is beautifully infused into the turkey, which perks the meat up with just the right amount of heat and spices. Satay’s trusty companions — ketupat (rice cakes) and a house-made ground peanut dip — are served with the Satay Turkey. If you cannot get enough of the salted egg yolk trend, go for the salted egg yolk turkey, which has been seasoned for more than a day in salted egg yolk, butter, aged rice wine, curry leaves and chilli padi. Drawing inspiration from the scent of logs burning in the fireplace of a cabin in the woods, head chef Sujatha Asokan has created a festive menu at Botanico around the cooking technique of smoking. Traditional turkey is given a smoky twist as a roulade smoked in an infusion of oak chips. 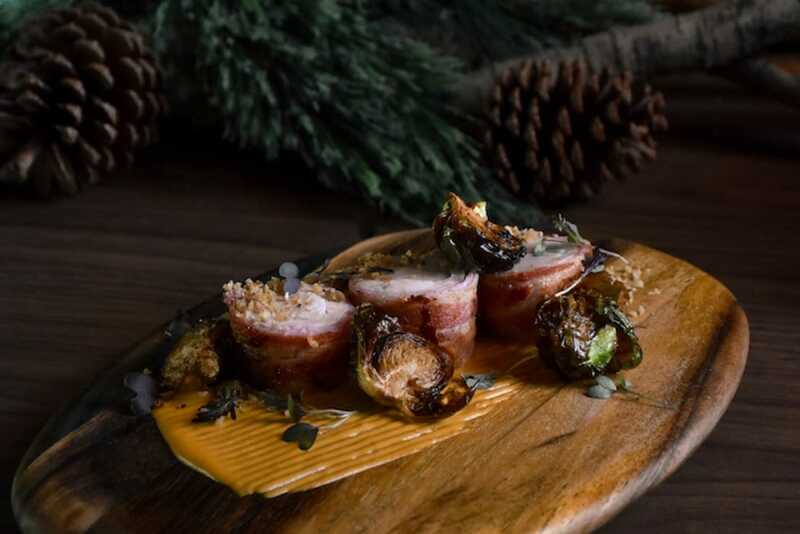 The smoked turkey roulade is served wrapped in bacon with stuffing alongside curried mash potatoes and shallow-fried Brussels sprouts. Other smoky creations include Inka-grilled Sanchoku wagyu rump and earth quince Christmas pudding for dessert. The six-course brunch menu is priced at $68++ per person and the seven-course dinner at $88++ per person from 23-25 December. 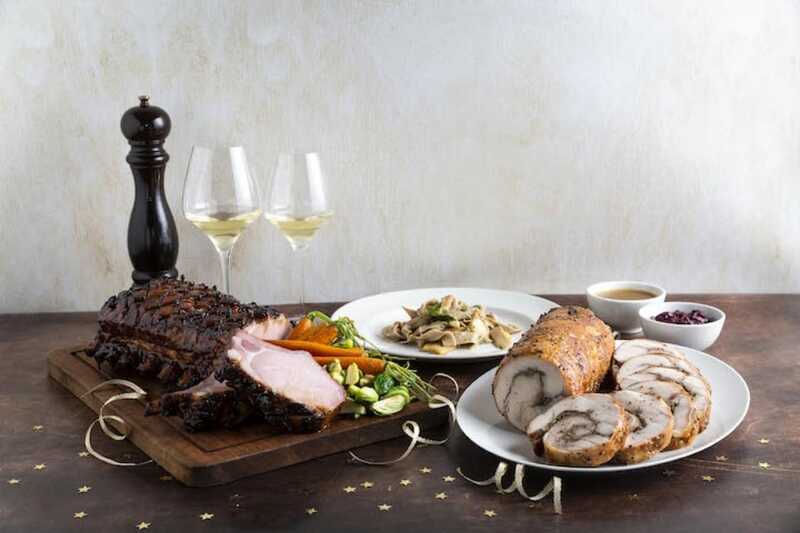 If you’re too lazy to carve a turkey, opt for a Turkey Porchetta by Nostra Cucina, the Italian restaurant which has taken over Osteria Mozza in Marina Bay Sands. The Turkey Porchetta, which resembles a log cake, is a bolster-shaped roll of turkey breast and leg meat stuffed with pecorino, parmigiano reggiano and sage. The cheeses pepper each mouthful with a dash of saltiness that perks up the meat. Each mouthful is rounded off with a tinge of bitterness from the sage. The meat roll is served with cranberry sauce and pine nut salsa. Available as part of the Christmas Eve four-course dinner ($98++ a person) and Christmas Day three-course brunch ($98++ a person). Rethink the classics this holiday season with fine-dining Indian restaurant Tandoor’s bestselling festive takeaway item — tender, spiced Tandoori Turkey.